The author of Mesmerized delivers another fascinating glimpse into history, this time the story of two brave suffragists on a trek across America to spread the word: Votes for Women! Mara Rockliff is the author of many books for children, including Mesmerized, Anything But Ordinary Addie, Chik Chak Shabbat, and Me and Momma and Big John, winner of a Golden Kite Award. Mara Rockliff lives in eastern Pennsylvania with her family. Hadley Hooper is a fine artist and illustrator whose work for children includes The Iridescence of Birds: A Book About Henri Matisse by Patricia MacLachlan, named one of School Library Journal’s Best Picture Books of 2014. Hadley Hooper lives and works in Denver, Colorado. Rockliff’s snappy, sassy text is matched by Hooper’s inventive illustrations, which crackle with activity. Using yellow as the signature color throughout, she offers pictures that brim with humor, even as they capture the underlying notion that crossing the country in the early days of motoring was no picnic...kids with questions will find much in the back matter about the movement. A delightful way to introduce two fascinating historical figures. Three, counting the kitten. Rockliff communicates the boundless energy of these two figures and adds touches of humor to lift the narrative; this small but significant historical moment is presented as accessible and fun without undermining the importance of Richardson, Burke, and the fight for women’s equality...Prepare for the arrival of the “little yellow car” into the hearts of readers; this charming and vibrant account of two lesser-known figures will bolster historical collections. In an account as lively as it is informative, Rockliff (Mesmerized) commemorates the centennial of a daring, dangerous, and successful publicity stunt undertaken to promote women’s voting rights...Various shades of the movement’s signature color, yellow, feature prominently throughout, and endnotes offer additional details on the early automobile, as well as other key figures and milestones in the women’s suffrage movement. A lively look at the ingenuity of women suffragists near the end of their long road to the vote. Around America to Win the Vote will be a wonderful complement to classroom discussions during this election year and an important addition to the literature surrounding the upcoming centennial of the passage of the 19th Amendment in 1920. The final message for all readers: Vote! With illustrations that add excitement to the story, this will be an easy read for students and will provide opportunities for research of the suffragist movement in addition to the history of the automobile and road travel. American women finally got the right to vote in 1920 with the passage of the 19th Amendment. But it had taken a lot of work and many years to get it done. 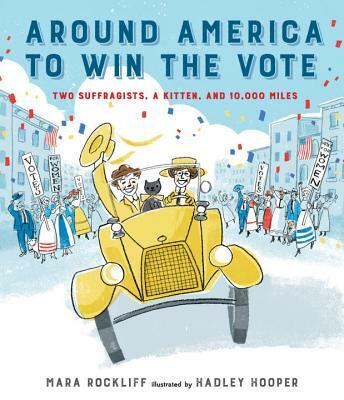 This lively and colorful picture book, aimed at ages 5 and up, tells the tale of Nell Richardson and Alice Burke, who drove across the country from New York in 1916 to rally support for suffragettes. This enchanting story of two dainty and untried women driving across America alone is a perfect example of the true spirit of American adventure...Rockliff’s prose is energetic and chock full of giggle-inspiring prose. Artist Hadley Hooper’s illustrations are a celebration of life. In tones that manage to be both whimsical and reverential, Around America to Win the Vote follows the long road journey of Nell Richardson and Alice Burke, who traveled America in 1916 to raise awareness for women’s suffrage. Ample bursts of jaunty art propel the story from Philadelphia to New Orleans, the Rio Grande, New Mexico, Arizona, and California, returning to the Atlantic Coast via a northern route. Rockliff’s careful research results in a fascinating story that drives home the very real dangers of this road trip to young readers, underscoring Richardson and Burke’s determined commitment to their cause. The book has the lively feel of an adventure story, and the women are fun and savvy...The art is as charming and colorful as its subjects, and the women's story brings the period and movement to light. Rockliff’s text is as energetic as the two suffragists who made the 10,000-mile journey, and Hooper’s illustrations, done in pencil and printmaking techniques, then scanned and completed digitally, complement the spirited text.